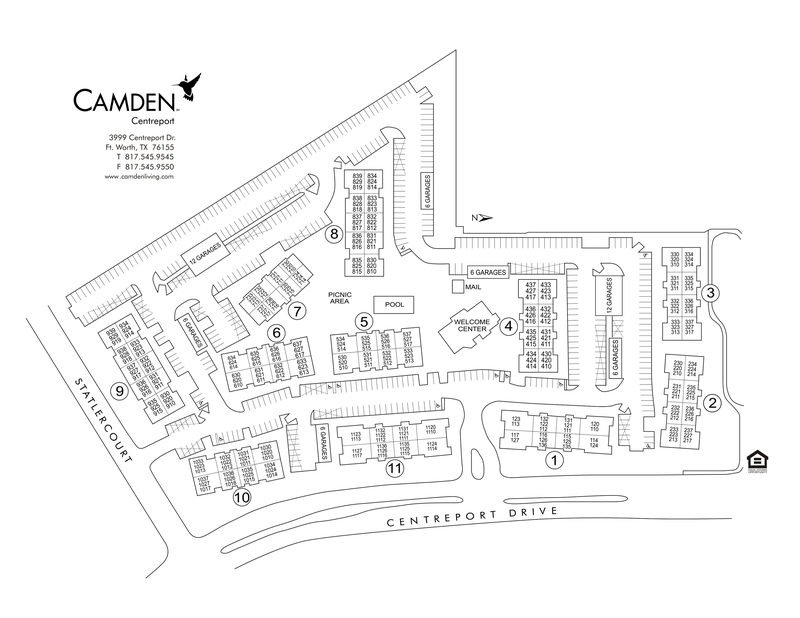 Camden Centreport offers one, two and three bedroom luxury apartment homes in Fort Worth, TX. With an ideal location nestled between Euless, Arlington and Grand Prairie, your commute will be a breeze with easy access to Highway 360 and Highway 183. Also enjoy the convenience of the DFW Airport and the American Airlines Headquarters being just a short drive away. All of our beautiful apartment homes include stainless steel appliances with built in microwaves, 9 foot ceilings with crown molding, granite-style countertops and washer and dryer. Select homes feature hardwood-style flooring, built in bookshelves and private balconies with storage. Take advantage of the many perks that Camden Centreport has to offer such as our 24-hour fitness center with free weights and a variety of cardio equipment including treadmills. Get work done in a quiet place with free WiFi at our business center. Enjoy relaxing outdoor retreats in the cabanas that surround our refreshing pool and vibrant fountains or cook out on the grills in the picnic area. If you need extra storage space we’ve got you covered! We have private garages available for rent to protect your car from the Texas heat too. Our apartment homes are located right off of Highway 360 and just minutes from President George Bush Turnpike and Highway 183. We are located just 4 miles from River Legacy Park, and a short drive from AT&T Stadium and Globe Life Park and Six Flags Over Texas in Arlington. Or go explore McCormick Park and Midway Park in Euless, less than 10 minutes away. Residents receive a money-saving technology package that includes high-speed internet up to 300 Mbps and 125+ digital channels + HBO. Looking for more options? Access Spectrum TV from your smart device as well as over 250,000 Spectrum WiFi hotspots nationwide. Stop searching - come home to Camden Centreport! We'll save a spot for you! We offer our residents ample parking on a first-come, first-server with designated visitor parking. We also have detached garages available for rent for $95 per month and carports for $35 per month.